Quickly and easily make it as a last minute stand in for those late requests. It will please you and the person you make it for without any stress what so ever. And that makes it a good card fold to keep up your sleeve ... and one you are sure to return to time and time again. 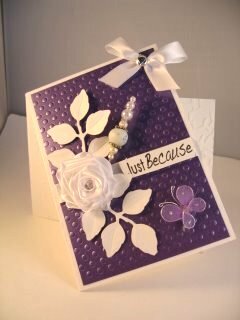 From one piece of card you can make this and then decorate it to suit the person you are sending it to. Both ideas just stop the card from being to plain. And to make the Tilt Card special I have made the addition of a beautiful Hatpin. Whatever you decide to do to the basic card it will look good. Distress Inks and to help you with this you will find a series of three videos on how to colour skin, hair and clothes in the Tutorials. The Doyley behind the image is something that is taking the card making arena by storm and you will other ways to use these in Paper Lace. 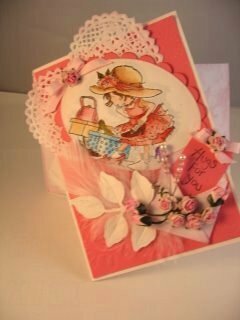 The feathers and flowers all add that finishing touch to what is a very girly card.